He (or she) is a long-eared bat, Plecotus auritus, whom I photographed (when the plumbing went wrong) in January 2010. I’ve seen his droppings around since, but haven’t spotted him again till now. He’s likely to be the same individual though, as they roost, and hibernate, solitarily, and there’s no reason why another one should find his way in. Nice to know he’s doing well at 4 years old, or more. I wondered what lessons he might teach me in connection with recent evolutionary musings. My first mental connection was Thomas Nagel’s essay What it is like to be a bat, which I’ve mentioned before. Nagel’s core thesis is that there is an irreducible, non-material reality about “beingness” – science, in other words, can never, even in principle, capture the subjective experience of being my bat. So that immediately raises the philosophical conundrum of how “batness” could evolve by a material process apart from the will and wisdom of God. The earliest fossil insect-eating bat found to date is 50 million years old and is very similar to the species of bats that exist today, indicating that by that time they had already largely evolved. The next bat fossils start turning up in the Eocene, in sites with unusually complete preservation of whole skeletons, such as the Green River Formation of Wyoming and the Messel Shale of Germany. These fossils represent essentially modern-looking microchiropterans; bats had evolved all of their characteristic features and begun to diversify by this time. In fact, the oldest known complete fossil bat, the Eocene-age Icaronycteris … shows specializations of the auditory region of the skull that suggest that this bat could echolocate. Unfortunately, no ‘missing links’ have yet been found to show clearly the bats’ evolutionary route – their bones are very thin and fragile, so bat fossils are rare. The most likely suggestion is that they all evolved from a shrew-like mammal that climbed trees, apart from the large group known as fruit bats, which seem to have had a different origin. The earliest known fossil of a fruit bat is only 35 million years old. Although fruit bats appear superficially similar to insect-eating bats, they are very different in a number of ways, including the shape of their skulls and teeth, their neck vertebrae and the bones in their hands. It is likely that they evolved along a very different path from the insectivorous bats, one that branched off from the primates, the group that contains monkeys, apes and humans. It is possible, therefore, that these bats are distantly related to us. Note the missing evolutionary route, or routes, again – just as in the case of the pterosaurs and nearly every other group one can name. Now, bats being such fragile beasts, they seldom fossilize, so one must expect gaps in the record. The classical story has been that bats evolved long before the fossil record begins, almost certainly from shrew-like insectivores. Though in fact my ancient (1923) Cambridge Zooology text shows the first suggestion was that they evolved from primates, presumably from the morphology of fruit-bats. Old problems come back to haunt, it seems. The two very different orders (insectivorous and fruit bats) diverged, it is said, long before the first fossils. In the 1980s, a hypothesis based on morphological evidence was offered that stated the Megachiroptera [fruit bats] evolved flight separately from the Microchiroptera [insectivorous bats]. The so-called flying primates theory proposes that, when adaptations to flight are removed, the Megachiroptera are allied to primates by anatomical features not shared with Microchiroptera. One example is that the brains of megabats show a number of advanced characteristics that link them to primates. Although recent genetic studies strongly support the monophyly of bats, debate continues as to the meaning of available genetic and morphological evidence. Morphology and genetics don’t agree – haven’t I heard that before somewhere? One really can’t emphasise sufficiently the differences between the two orders – vision v echolocation (with the dramatic auditory, perceptual and Nagelian “mindset” that involves), dentition, diet, skeletal features, size, behaviour. And the fruit bats have even re-acquired (or the insectivores lost) the claw of the second flight-finger. Yet by any scenario there is also remarkable convergence: if as the genetics suggests they all evolved from insectivores, the fruit bats diverged from their insectivorous common ancestor to resemble primates in many important respects (and yet appear 20 million years later than primates in the fossil record). On the other hand, if the Natural History Museum’s morphological conclusions are right, primates evolved a near-identical flight solution to that found by a completely different mammalian group tens of millions of years before. When one considers how different the bird wing, pterosaur wing, and bat wing are, that requires a great stretch of the imagination. Indeed, there are pre-pterosaur flying reptiles with, yet again, a completely different wing arising from the hind limbs. And don’t forget that all these groups have entire body plans built around their chosen wing pattern. There seems no reason primates could not have evolved like pterosaurs rather than bats. It almost raises the speculation of an unlikely bat-primate hybridisation, as humans have been seriously suggested to be pig-chimp cross. Whatever else it is, the story is not straightforward, and evolutionary theory doesn’t actually give us any very clear explanation of bats. Detailed pathways aside, though, I also reflect on my recent posts on natural selection and neutral evolution. My wonderfully non-standard-mammal friend in the loft got that way, according to what I’ve been reading, from random mutations mainly uncontrolled by natural selection. The jury appears to be divided on whether natural selection was a significant player in phenotypical evolution – Masatoshi Nei would say that if the genetics evolve neutrally, so must the organisms, and he is no fool. 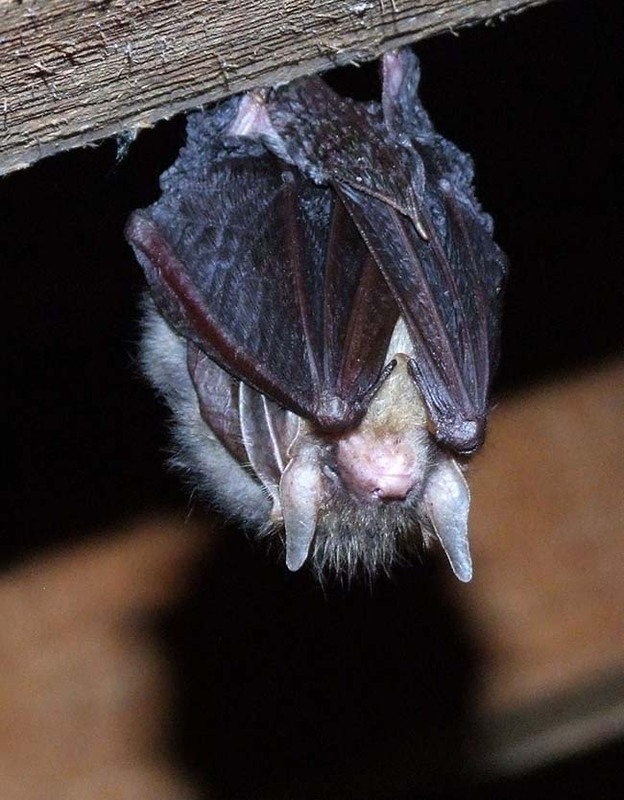 The first placental mammal fossil is 160 million years old, so bats admittedly had anything up to 110 million years to get this way… or that way, since a fruit bat would find it as hard to imagine being a long-eared bat operating on echolocation as I would. But is it plausible that either group just happened to change in that direction and found it useful? It’s a stretch of credibility even when Darwinian natural selection is admittted to be involved, so what if its role is dramatically reduced as the neutralists are now saying? Nothing looks accidental about a long-eared bat, especially when you watch it hunting. Certainly, though, evolutionary theory seems to raise more questions than it answers about bats. There are a lot of loose ends in all kinds of areas. And a loose tile somewhere, as well, which is more to the point.